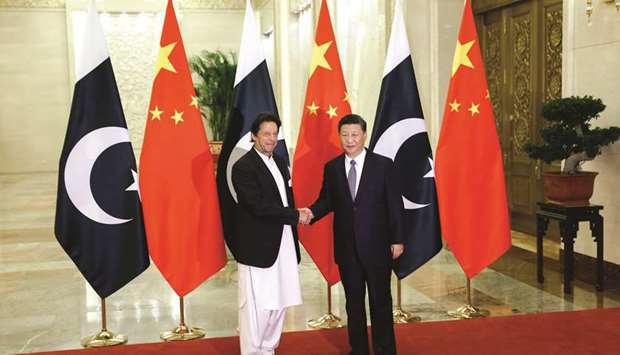 China’s President Xi Jinping (right) shakes hands with Pakistan’s Prime Minister Imran Khan ahead of their meeting at the Great Hall of the People in Beijing yesterday. “I attach great importance to China-Pakistan relations and am willing to work together with the prime minister to strengthen the China-Pakistan all-weather strategic partnership and build a new era of China-Pakistan destiny,” Xi said. China promised to support Pakistan’s economy yesterday as Pakistan Prime Minister Imran Khan told of his country’s “very difficult” economic situation amid a burgeoning financial crisis. Pakistan’s foreign reserves have plunged 42% since the start of the year and now stand at about $7.8bn, or less than two months of import cover. Last month, Pakistan received a $6bn rescue package from Saudi Arabia, but officials say it is not enough and the country still plans to seek a bailout from the International Monetary Fund (IMF) to avert a balance of payments crisis. Meeting Chinese President Xi Jinping in Beijing’s Great Hall of the People, Khan said he’d come to China to learn. The Pakistan prime minister’s office said later that Xi had accepted an invitation to visit to the country. Khan will meet Chinese Premier Li Keqiang today, when the two countries are expected to sign a series of agreements.